I never thought I'd ever use Bcfs instead of Tcfs to quantify working gas in storage, but it just goes to show that you never know... 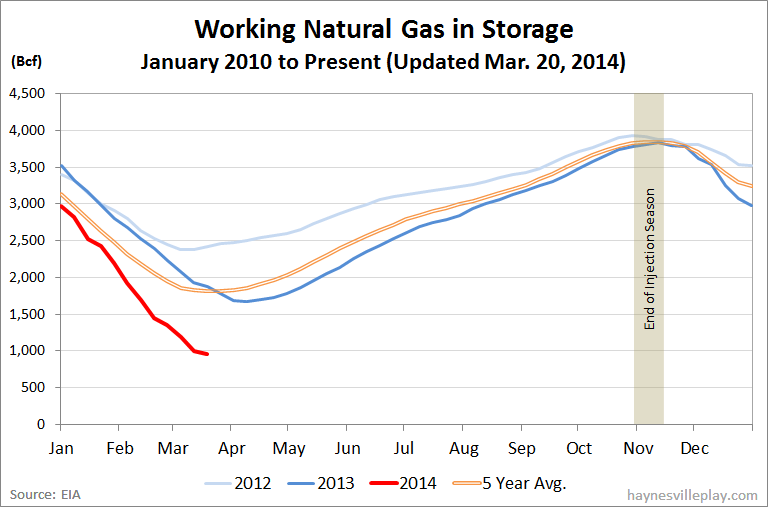 The EIA reported today that working gas in storage last week dropped 48 Bcf to 953 Bcf. The withdrawal was 35% below last year (-74 Bcf) but 60% greater than the five year average (-30 Bcf). The current storage level is 49.4% below last year (1.885 Tcf, a difference of 932 Bcf) and 47.9% below the five year average (1.829 Tcf, a difference of 876 Bcf). Temperatures in the Lower 48 last week averaged 43.9 degrees, which was 0.6 degrees warmer than last year and 1.0 degree warmer than average.